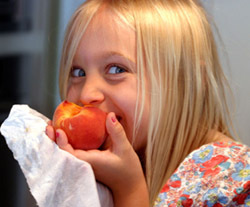 Connected Health » Mobile Phone Apps » Can an app REALLY encourage kids to eat healthy food? Most parents – or even those with small relatives – will know that sometimes getting kids to choose healthy foods over cakes, sweets and fizzy drinks can be a real nightmare. Some are obviously willing to give those sprouts a taste, but most are tempted by the bright colours and sugary highs of things that are much worse for their health. Over in the US, the End Childhood Obesity Innovation Challenge has invited a number of individuals, companies and developers to devise ways to encourage kids to eat well and Dennis Ai used the opportunity to create JiveHealth, a smartphone game aimed solely at kids.